Each and every year, PM-Partners group train and certify over 6500 professionals. Because we are passionate about helping people achieve their professional and personal goals. We recognise that enhanced learning can often provide a pathway to a better future, including a pay rise or a promotion. However, for some, education can provide the foundation to make a life changing difference. 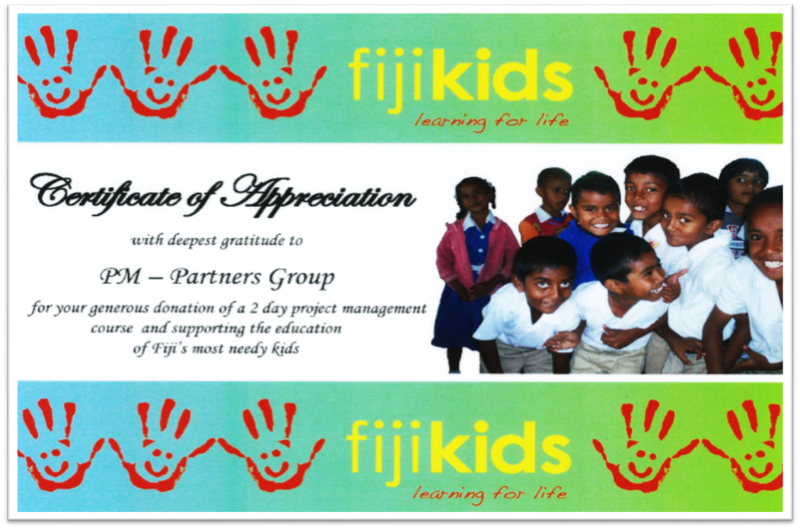 This is one of the many reasons why we contributed a prize donation to a fundraising trivia event, held in October to raise funds for ‘Fiji Kids! Learning for Life‘. Fiji Kids! Learning for Life is a grassroots charity providing financial assistance and support to children for the duration of their primary and secondary education. The cost of school fees, uniforms, shoes, books and transport is covered ensuring the children get the education they need, hopefully breaking the cycle of yet another generation being trapped in poverty. If you too want to make a difference to someone’s future then please visit their website and donate today. You donation will allow the children in Fiji that need it get the education they deserve. PM-Partners donated a Project Management Fundamentals 2 day workshop worth $1100 to the worthy cause. As its name implies, this workshop will provide participants with the essential knowledge and skills to both manage a project end-to-end, and/or be an effective and valuable member of the project team. It covers the fundamental steps in every project’s life cycle and uses a real life case study approach in order to follow a project from conception through to completion and final review. For more information contact us today on 1300 70 13 14 to speak to a Professional Development Consultant.